Dawn Beach – On Friday February 22, 2013, a total of 108 persons took the pledge of allegiance before His Excellency, Governor Eugene B. 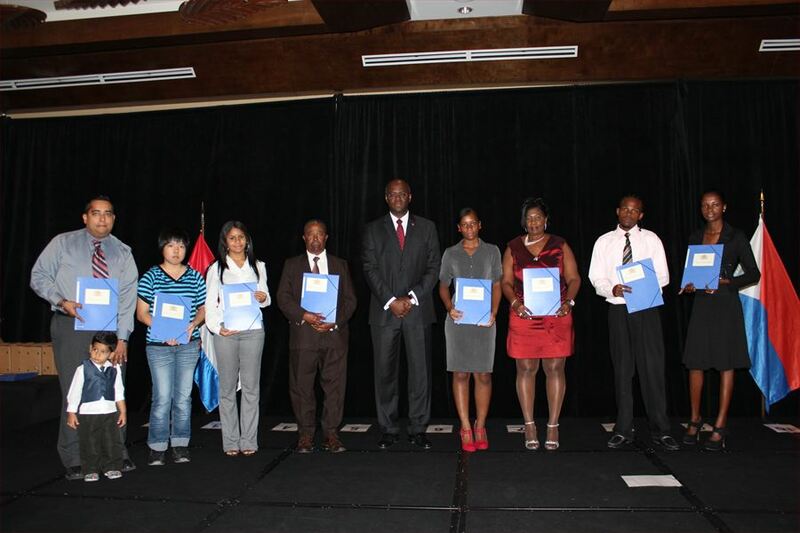 Holiday during the naturalization Ceremony which took place at The Westin Dawn Beach Resort and Spa. The pledge of allegiance, as being expressed in either taking an oath or making a promise, is the final mandatory step in the process of obtaining the Dutch nationality. Governor Holiday in addressing the gathering, explained that naturalization or option is a legal process under the Dutch Kingdom Law whereby a person may be granted Dutch Citizenship. Obtaining the Dutch nationality, through naturalization or option, is a special and transformative moment in a person’s life. A moment following a long legal and administrative process. A process of meeting a number of statutory requirements, including those related to residency, parental ties, "good conduct"; a process of demonstrating an attachment to the social and cultural values of Sint Maarten and a process of proving knowledge of the constitutional principles upon which the Dutch Kingdom and St. Maarten are based. Stating that the 108 persons come from 18 different nationalities with varying backgrounds, Governor Holiday addressing the gathering emphasized: “In the context of the St. Maarten community it is the start of a new chapter in your life. For the younger ones among you St. Maarten may well be all you know and this day will be a confirmation of your relation with the St. Maarten Community. For the older ones among you, today is truly a new beginning. It is my hope that for all of you it will be a journey of growth towards a stronger St. Maarten.” As a result Governor Holiday advised the new citizens as they begin this journey: to respect and hold dear the St. Maarten Song, oh Sweet St. Maarten land, to salute the St. Maarten Flag and Dutch Flag, to observe and celebrate St. Maarten’s day, to acquaint themselves with St. Maarten’s history and customs; and to seek to serve their new country.